Divorce – The truth about what it really is. Divorce – what does the word divorce really mean? The Merriam-Webster dictionary defines it as “the action or an instance of legally dissolving a marriage” (Merriam Webster, 2017). Divorce does indeed involve the legal action of “dissolving a marriage” but there are many other things involved in the process that adds to the difficulty we have going through a divorce. All divorces have three distinct moving parts that increase the stress levels of couples during the process. If you can understand the three parts and how they come together, you’ll be able to manage things a bit better and that can be very helpful. First, and the most familiar aspect of divorce, for most people, is the legal process of actually moving from ‘married’ to ‘divorced’. 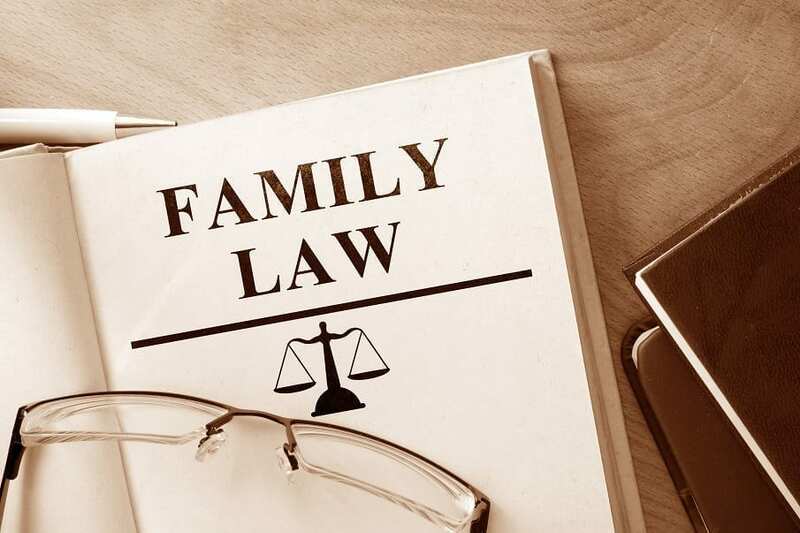 The legal process is usually somewhat mysterious and misunderstood as you enter a separation and almost everyone, from Aunt Doris to the lady next door, will have ideas to share on how it works. Please stick to the facts and remember that divorce in Canada is “no-fault” so the legal aspects of divorce are strictly a business transaction. The second part of the divorce process involves the many changes that take place. All areas of life usually change a great deal, and all this change happens simultaneously. Change during a separation and divorce is so massive, it can easily overwhelm you and your ex-partner, so recognizing the changes and planning ahead as best you can will help you decrease your stress levels, remain amicable with your ex-partner, and keep things working better as a divorcing family. The third part of divorce is the emotional upheaval for everyone involved. The difficult emotions are usually underestimated until people have started the process. Emotions during a divorce can be very intense and are absolutely normal. Understanding how the emotional process unfolds will help keep your relationship more manageable as it changes from spouse to ex-spouse. If you can understand where you are and where your partner is in the process, you can both be more sensitive to each other and things will go better for both of you. If you map out these three areas, and keep them as distinct and separate as possible, it really can help you manage better. 1+3 = The legal process being highjacked by emotions is the most common and volatile problem in divorce. You really need to keep your decision-making skills from being led by your emotions. The legal process can be thought of like business transactions and being highly emotional will make agreement difficult to reach, which will add both time and cost to the divorce process. 1+2 = The legal process and change add up to difficult situations too. If you can map out all the changes that need to happen – like moving for example – and decide how to look for the positive opportunities, the legal decisions will be easier to make and can lead you in the direction you choose. Remember that change is a big part of the process and the legal system is not to blame for all the changes. The changes really are a result of the relationship breakdown. 2+3 = The changes and the emotions when put together lead to the overwhelming aspects of divorce. Changes that need to happen can be mapped out and planned, and if you try to also map out the expected emotional journey and allow time to get used to the needed changes, things will go a little better. Especially for any children involved! Give yourself and your ex-partner time to adjust and try to control the direction and speed of the changes. Divorce, although always difficult, can be a period of self-exploration, tremendous personal growth and empowerment – if you are open to the opportunities. If you would like help managing your divorce or further your understanding of the way divorce works, please contact me to arrange a complimentary strategy session! 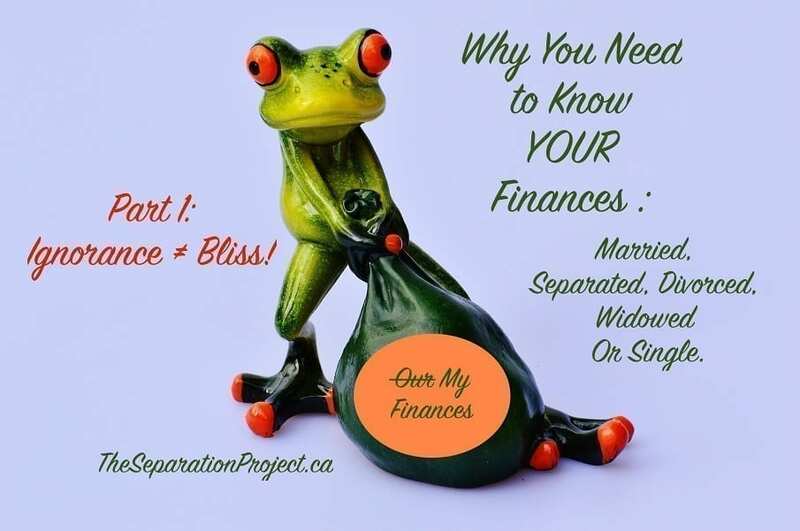 Why You Need to Know YOUR Finances: Married, Separated, Divorced, Widowed or Single. Part 2: Knowledge = Control! Knowledge about your finances can set you up to feel more in control and less stressed. Last month I wrote about how ignorance of our finances often leads to stress and financial woes. You can find the blog here. This month, I’m going to suggest ways to get comfortable with finances that will help you learn, ease your concerns and lead to feeling more in control with your personal finances. When you’re getting married or moving in together, discuss the finances and both of your ideas on what your ideal future looks like. This allows you to make plans together to work towards your shared goals. Share your information and the knowledge of how you plan to manage any debt and all the benefits of any savings, preferably before you live together as a couple! Talk about how you want to proceed financially. Discussing what you do NOT want is also very important. Examine and compare your money styles and get comfortable with how you each are similar and different. Few people have the same ideas about money – you don’t have to agree on absolutely everything, but you do need to get comfortable and learn to compromise on things. Once you share information and each takes responsibility for the pieces you have control over, you can start to make joint plans and take actions together that make sense for you as a couple. Even if one partner wants to ‘look after things’ please sit down at least once a year, if not every six months, for a review and planning session. See the numbers. Add up the totals. Readjust your plans for the future. Deal with any issues like overspending or bad habits head-on. Communicate respectfully and focus on problem-solving, not blame. Understand how things are working for both of you. Create one document of how things look, then update it when things change significantly. Include all your important information. Working together towards the same goals is much more satisfying for both of you and creates more motivation. Understanding your situation will help lead to feeling good about taking responsibility for both the good and the difficult and make any needed actions or corrections of your path easier to follow. Being accountable to each other helps develop good money habits and makes goals easier to obtain. Making sure either of you can monitor your joint holdings like a mortgage, line of credit and any joint credit cards will instill more trust and honesty. To clarify: It’s not necessary to combine everything and share one joint banking account, but you do need to be accountable to each other for your future plans and be able to look at each other’s information and money habits openly. You don’t want secrets that may sabotage your assets and hurt the future of your relationship. We all make mistakes at times. Learn the lessons that mistakes teach you both. Keep communicating openly and with respect and move on. Share the victories you make as a family and as individuals. Celebrate the accomplishments and goals you reach! Find ways to motivate yourselves to stick with it and enjoy the process. Take turns doing some of the necessary and sometimes mundane tasks and hold each other accountable. Try and make finance time fun and motivate yourselves for good habits with enjoyable rewards that fit your budget. If you’re on your own – single, separated, divorced or widowed – book a date with your finances at least every six months, maybe monthly if things are difficult and you need to budget and pay bills. It does get easier as you learn the ins and outs of your own finances. You can get good at it, exercise more control, and find life becomes less stressful as you understand your unique situation better – it just takes a desire to learn and a bit of persistence. Don’t forget to celebrate your wins as you learn about your finances and make gains. Reward yourself with something enjoyable for a job well done. Having a confidante about some of your goals and being held accountable can be a tremendous help. There are professionals that can help you with investments, budgeting, and your financial knowledge. The internet is full of good information if you stick to reliable sources. There are courses, videos, and good television shows available that can all help. Many great books are available on any finance topic you seek. Ask good questions and keep asking until you gain understanding. Nothing in finance is a stupid question! If you don’t get a satisfactory answer, ask someone else or look somewhere else. Personal finance is a life long journey. You make mistakes – you learn. You make more mistakes – you learn more. Keep your money goals in mind. Knowledge about your finances = able to make informed decisions. Knowledge about your finances = able to take meaningful actions. Knowledge about your finances = improving what is not working. Knowledge about your finances = feeling confident and in control. Knowledge about your finances = feeling empowered. that is in your budget be motivated and more willing to pitch in and stick to budgets and plans. Teaching your kids about finances will help empower them for the rest of their lives. Please contact me if you would like some help reaching your goals. I can help you find the knowledge you need to feel good about what you do have and what steps you need to take to get where you want to be with your personal finances and your life! To be clear, I do not offer financial investment advice, but I do offer helpful tools, resources, and information to help you get started. I am also a great accountability partner if that is what you need! Why You Need to Know YOUR Finances: Married, Separated, Divorced, Widowed or Single. Part 1: Ignorance ≠ Bliss! As a Divorce Coach, nothing makes me sadder than a client who has no idea what they and their soon to be ex-spouse own or owe. Their fear of the unknown is devastating as they don’t know what to do about their marriage breakdown and are panicking, worried and do not know how to pay for any help. If you are part of a couple or completely on your own, not knowing your own financial situation serves no one. Not you, not your partner, no one. In fact, your lack of knowledge may cost you and benefit your partner if you ever file for a divorce because it may result in costly mistakes during negotiations. Not paying attention = making good decisions is very difficult. Not paying attention = you cannot make realistic plans. Not paying attention = you will not take action to improve things. Not paying attention = you are not in control. Not paying attention = stress and worry. It’s easy to say that financials are boring. I get it. Some people have no interest in numbers. Some don’t want to think about the bills or the costs of a home. Many find math too difficult and tedious. Some people seem to believe that ignorance can equal bliss. This bliss, for many, may have a very thin veneer. If you look carefully at people who have no idea about their finances, there is still anxiety and unease about the unknowns. They may also feel insecure and dependent, which may erode trust, shut down communication, diminish self-worth, and lead to unbalanced and unhealthy relationships. If you lose your partner through death or divorce, you may soon regret your lack of interest in money matters. Emotionally charged life changes are already overwhelming without adding extra unknowns and financial concerns. Get over it. Facing the reality of your finances is always empowering and can be very motivating. Financials don’t have to be overly complicated or difficult. Keep things simple and take control! Thankfully, most couples are not dishonest or devious with finances, but be aware that some people will hide things they are ashamed of or embarrassed about. Not tracking your finances makes money moving and potentially disappearing much more tempting if there are any financial problems. Keeping your eyes on things is the first defense to protect your assets. Unfortunately, I do hear of moved investments, emptied bank accounts, overdue invoices that money was paid for, maxed out credit cards and lines of credit that have been drawn up to the limit that one partner in the couple is not aware of until a relationship problem starts and they start checking. It is not a pleasant surprise to find savings depleted or debts sky high during already difficult emotional times. Usually it could have been avoided or minimized if there was more attention paid, more accountability and some shared monitoring. How do we relate to our finances and why? Finances are something we first learn from the example our families set. We often learn bad habits and bad attitudes without realizing that we have other choices. What did you learn from your family that is useful? Did you learn that one person runs the finances? Often at the start of a relationship, especially a more traditional marriage, one partner takes on most of the business side of the household. They may be paying the bills, doing the taxes and planning for retirement, investment, and living expenses. This can be either partner, but often we do what our parents did. Did you learn that everyone has his or her own money? Recently, in relationships with both partners working, I see couples who have never even discussed their finances or future plans. Partner’s salaries, savings or debt are all unknowns. Basic philosophies on spending and saving are not discussed. Everyone pays their own expenses and keeps their own money. This may appear like a good plan on the surface, but the lack of communication and shared goals may be a red flag for the relationship. Both the finances and the long-term health of the relationship can suffer when there is no accountability or shared responsibility taken on as a couple. Did you learn that ignoring the finances was okay? I would also like to note that people living on their own, as well as some couples, sometimes avoid stress by not looking at their finances and just pretend everything is okay, but stress and worry are usually just under the surface. This strategy can be a disaster if spending is outpacing earnings. Unfortunately, credit today is not too difficult to get and people get into a great deal of debt without realizing the implications of their spending habits. Did you learn that money was something to be discussed openly and honestly? If you were lucky enough to have a family that was open about discussing financial goals and helping you learn the basics you are very fortunate and are probably much more familiar and comfortable with finances. Please start looking over your financials! Set yourself up to learn what you need to learn! Find some control and reduce your stress levels! Stay tuned for Part 2: Knowledge = Control! Please contact me if you would like some help with planning your future. I can help you get the knowledge you need to feel good about what you do have and what steps you need to take to get where you want to be with your finances and your life! To be clear I do not offer financial investment advice but I do offer helpful tools, resources, and information to get you started looking at your finances. 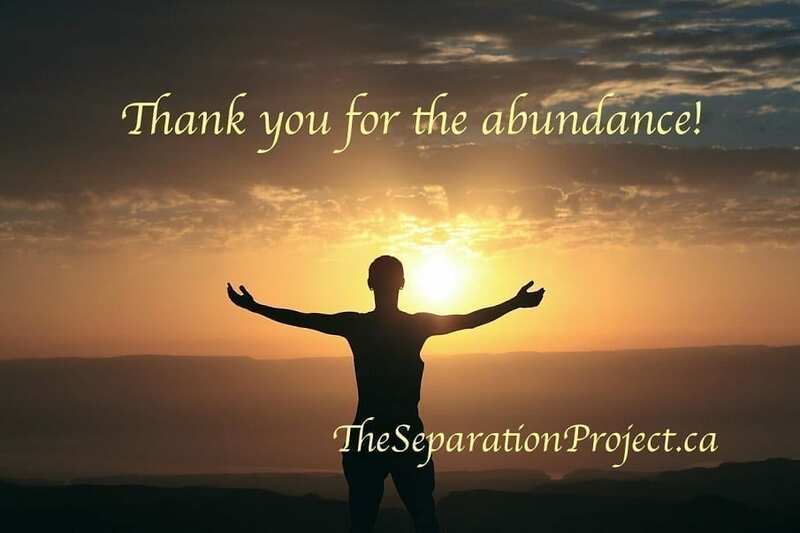 Last month I defined scarcity and abundance and demonstrated how the two mindsets may have a massive impact on separation and divorce by using some yummy pie scenarios. You can find the post here. 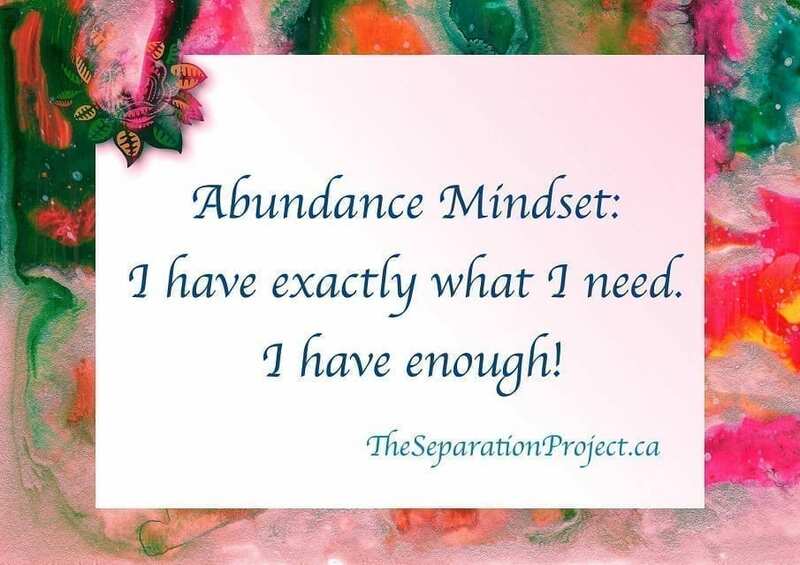 Now that the advantages of an abundant mindset are clear, how do your encourage your own abundant thinking to increase? Below are nine simple ideas to remember as you work on your mindset. It does take practice! Being aware of the existence of both scarcity and abundant thinking and how it affects us is the first step of changing your own beliefs. Start noticing where abundance and scarcity show up in your day-to-day life. Where is it absent? Open yourself up to thinking about positive possibilities! What are your closely held beliefs? Are your beliefs based on what is true? Keep checking in on how you are thinking and try to shift towards abundance. There is always something good that comes out of every situation, even if it’s just a difficult lesson. Knowing you control your thoughts and reactions and changing how you think about things can profoundly change how you feel about things. Change how you view a situation and the emotions that appear will shift to match your perspective. Are friends and family filling your ears with scarcity? Sometimes scarcity is what you’re hearing from others, and pointing this out may help them change their scarcity thinking habits too! If they won’t stop the scarcity banter, you may need to minimize time spent with energy-draining friends or find some uplifting people to spend time with instead. Listen to the words you are choosing. What are you saying to yourself? Is your habitual self-talk nasty? If it is, try talking thoughtfully to yourself like you would to a child or good friend you are trying to support. It not only feels much better, but the payoff is profound for your self-esteem. Become your own best friend! Negative self-talk is such an important habit to break! How are you speaking to others? Are you speaking to others like you want to be spoken to? This is especially important when you speak to children. Encourage positive conversations and seek to uplift. Talk to yourself and your friends with love, respect, and encouragement. Are you acting like you have enough? Can you be generous with what you do have? Feeling abundant and still able to give during difficult times is very fulfilling and can feel very good for the soul! It is a great example to set for others and truly there is always something we can give to those that are less fortunate. Are you taking small steps to create what you do want in your life? Small steps made with a well thought out plan of action can add up to truly massive accomplishments. One of the best ways to improve abundant thinking is simply being grateful for everything you do have. A truly wealthy person is someone that is happy with what they have. I wrote an entire blog post on gratitude that you can find here. Set up a reminder or touch stone, to remind yourself to keep bringing your thoughts back to abundance whenever possible. This habit comes with repeated practice. I used to carry a quarter in my pocket with a red heart painted on it. Every time I felt it in my pocket, it brought abundance and gratitude to mind. Every night as I took it out of my pocket, and every morning as I replaced it, I thought about how fortunate I was during my separation despite the situation. Your reminder could be a picture you see every day where you pause to reflect or something you set somewhere to remind yourself how thankful you are for everything good in your life. I also want to say that abundance wins every time, even if your ex-partner is locked into scarcity and is not interested in negotiating towards a fair settlement or being reasonable. Thinking abundantly and not responding with scarcity will let you feel better during the process and may make it easier to negotiate something that is fair. Just keep repeating that you want what is fair and have a good explanation of what fair looks like and why it is in fact fair. Of course, this only works if your solution is fair to everyone involved. Court settlements do take into account if you have been trying to be reasonable and reward good behaviour during negotiations. If you are thinking about separating or already in the thick of it, an abundant mindset and some planning can improve your separation and divorce process! I can help you find your abundance and the best path through to healing. Scarcity and Abundance: Can your Mindset Impact your Divorce and Separation? When I first became aware that my marriage was over, and realized that both a separation and a divorce were in my future, my mind immediately painted a picture of me, out on the street, destitute, cold and alone. It was a very negative image and it left me feeling both sad and pathetic as well as fearful and panicky. This was probably my first real experience with how strongly a scarcity mindset can influence my emotions! Going through a separation and a divorce is difficult. In separation or divorce there are rarely any real winners, but how you think about the situation makes a big impact. 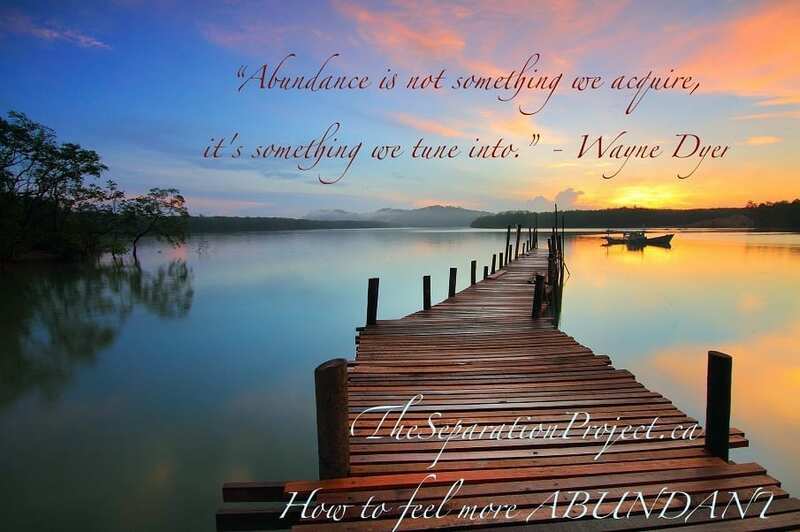 Are you feeling scarcity or abundance in your life during your transition? Let’s examine the two mindsets and how they may affect your thinking, feelings, and actions during separation and divorce. What is a scarcity mindset? “Most people are deeply scripted in what I call the Scarcity Mentality. They see life as having only so much, as though there was only one pie out there. And if someone were to get a big piece of the pie, it would mean less for everybody else. The scarcity mentality is the zero-sum paradigm of life. The Scarcity mindset has a short-term focus, and according to some recent studies, decision-making also suffers when you believe resources are scarce. Feelings of sadness, fear, anger and jealousy are common. We all know people who have gone through a divorce and have taken on the role of victim, clinging tenaciously to their ‘divorce story’ – how their life was ruined by others and how everything was, and still is, out of their control. These victims feel scarcity everywhere. Not enough money. Not enough time. Not enough energy. Not enough attention. Playing the victim at their own pity party can quickly become a crutch and, like most bad habits, it will become difficult to stop. A scarcity mindset discourages them from taking responsibility for their situation. Since they are not responsible, they also feel no need to take any actions to improve things. Scarcity really just encourages more scarcity. If you are in an abundant mindset your focus is usually long-term and your thinking is open to a bigger picture, more opportunity, and greater creativity. Your decision-making skills are usually optimal as you are able to see more possibilities. When feeling abundant, you are basically in a better place to handle a separation or divorce. There are no true winners in a divorce or separation, but with abundant thinking, you get much closer to a win/win or fair situation where both ex-partners can feel like they will be okay with the outcome. Like they will both have enough. Abundant thinking encourages us to improve our situation as best we can and move into action. Abundance encourages more abundance. I like to use the following scenarios to demonstrate how the two mindsets can impact a separation or divorce. Our unhappy couple feels like there is enough pie for both of them to share fairly so they use cooperation and divide up the pie neatly. 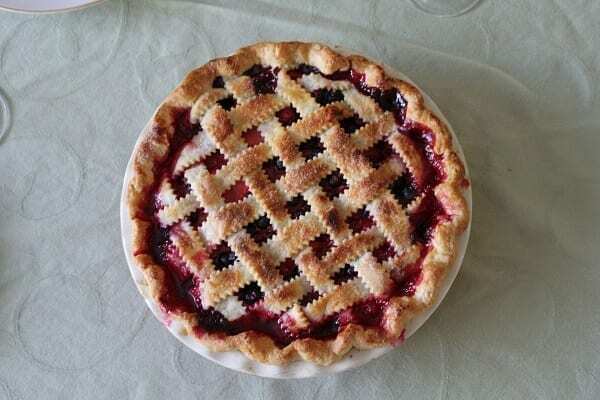 None of the pie ends up on the floor or on anyone’s face. In fact, they end up with about half of the pie on each plate. When the cleanup crew enters the room there is little work to do so they do not get any pie except maybe a few crumbs on the floor. They look around, check out the pie on the plates, declare it fairly divided, nod and bill a small fee for their assessment and tidy up. The ex-partners and the cleanup crew all happily move along with their lives. Our unhappy couple feels there is very little pie, they enter the room and both grab for the pie. They fight desperately for as much pie as they can get and end up with a big mess all over themselves and the floor. Little pie actually ends up on the plates for either to enjoy. The pie is ruined. There are bits of mangled pie and crumbs everywhere that the cleanup crew comes in and carefully cleans up taking a very long time. It is a messy and painstaking job to clean up such a big mess. Most of the pie ends up with the cleanup crew. The bits that do get put on the plates are unappetizing and not very satisfying. The cleanup crew happily bills the separated couple a lot of money for the clean up of the pie mess. The separated couple becomes even more unhappy because neither of them has enough pie and they now have a big clean up bill to pay. They both are resentful, angry at the outcome, and take a long time to move away from the scene of the destruction. They never forget what happened and how horrible it all was to experience. Only the cleanup crew is happy as they depart with the money they earned cleaning up. You can quickly see that an abundant mindset is a big advantage in the above scenario, as it truly is during a separation and divorce. In this scenario, things work out okay because everyone expected that they would have enough, so they were patient, calm and cooperated more. They each got enough pie and made sure that their ex-partner also had enough. Not only does each ex-partner end up with more assets, they are usually able to get along better if they need to co-parent or be civil in the future, they feel less stress and negative emotions so there is less impact on their health and well-being and there is less cost to get through the legal business of separation and divorce. They move on better into their new situation and know they will be okay. Any children will have happier co-parents and a higher standard of living with each parent than in the second scenario. In the second scenario, much of the assets were lost in the struggle and ensuing fight, so only a few assets are left. This is like going to court and having the judge make the decisions for you. The two people do not benefit much from the assets they have created together but the professionals that have to come in and clean up the mess end up with most of the assets paid to them in fees. The separating couple may take years to recover financially and emotionally. The entire family will struggle much more with the adversarial aspects of the situation and may never get over their hurt and resentment. Health and wellness may suffer for the whole family. If there are children, they may have years of difficult situations ahead of them, as their co-parents may not be very co-operative. In divorce, on average, each person ends up with approximately one-third of the assets they had before the marriage break up that were earned during the marriage. This is because approximately one third goes to the costs of the divorce and the extra costs of maintaining two households so everyone loses some of their affluence and standard of living may decrease. Looking at it logically, it becomes clear that if anyone receives much more than 1/3 of the assets that it may not be a fair settlement! Can you see how some people that do end up with their fair share still look at the whole pie they once had and think they were treated unfairly? The scarcity mindset distorts their thinking. Where are you on the scarcity/abundance spectrum? Please share your thoughts in the comments below as you become aware of how your thinking may be impacting you and your situation. If you are feeling scarcity about separating or divorcing, I can help you find your best path through and a more abundant mindset for the journey. So how exactly do you hire the ‘right’ lawyer? It is kind of like finding Mr. or Mrs. Right. Some time and effort needs to be put into the search! As a divorce coach, clients often report that when faced with a separation and divorce, they immediately rush out and quickly hire a lawyer without much forethought. Hiring the wrong lawyer can be a costly mistake that can impact the entire process of separation and divorce from start to finish. If you want to be in charge of your life during the business of divorce, you have to take charge and know that you and your ex-partner are the ultimate decision makers. Hiring professionals that align with your values and agree with your goals is very important. You are hiring a lawyer to do some work for you. You need to decide what is important to you. Then you need to research some lawyers and ask around for recommendations. Then you need to interview at least three lawyers to find someone who is a good fit for you. Then, and only then, you put down your hard earned money and start the legal part of your separation and divorce. Setting up interviews with three lawyers may seem like big investment of your valuable time, but if your case gets complicated, it will pay dividends. Hiring multiple lawyers in rapid succession is a much larger waste of your time and money. Yes, I know, early in a separation lots of things are already competing for both your time and money, but this investment of your time at the start of your divorce is well worth it. How long have they been practicing family law? What percentage of their practice is family law? Do they practice collaborative law? Are they willing to go to court, on your behalf, if they need to? What are the fees and how are they calculated? How much does it cost for their average divorce and how long does it usually take? What is the best way to reach them in an emergency? What are the costs and turnaround times for phone calls, email and appointments? Clarify before you get an unexpected costly invoice! What can you do to minimize your legal costs? How can either party terminate a client/attorney relationship that is not working well? Do they personally do all the work or do they work as part of a legal team? Your lawyer is not your therapist. Lawyers often charge by the hour, so give them a short honest outline of your situation, not the long emotional version. Be honest! If you tell the lawyer the sugarcoated version of your situation you will not get advice for the true situation. You will get the sugarcoated advice, which will not be as useful as honest feedback and basic advice. To minimize your legal fees, give the lawyers the documents they ask for when they ask for them. Making them get access to them may dramatically add to your costs. Being reasonable and fair goes a long way in getting a reasonable and fair separation agreement and divorce. Most lawyers prefer not to clean up after bad behaviour. Once the legal business of divorce is initiated, it usually makes communication with your ex-partner more difficult, not better, so try and maintain good communication if it exists. This is especially important if you have children and are co-parenting. If you can continue to talk together instead of having the lawyers start sending letters back and forth things may stay more civil. You also need to remember you get to make the decisions. The lawyer gives legal advice and suggests how to proceed, but you and your ex together are the decision makers. It is best to keep your family decisions between you. If you go to court, a judge will be making the decisions. You and your ex-spouse will give up any control over the decisions made that will affect your family and life for years to come. Is it actually time to hire a lawyer? I usually suggest other qualified divorce professionals talk with you before you hire a lawyer to get things organized and analyzed to take to the lawyer. This is especially true if you are still in the early stages and can go with your ex-partner together for an overview of your situation as a couple entering the divorce process if you are still getting along reasonably well. Having trouble managing your separation and divorce? I can help.